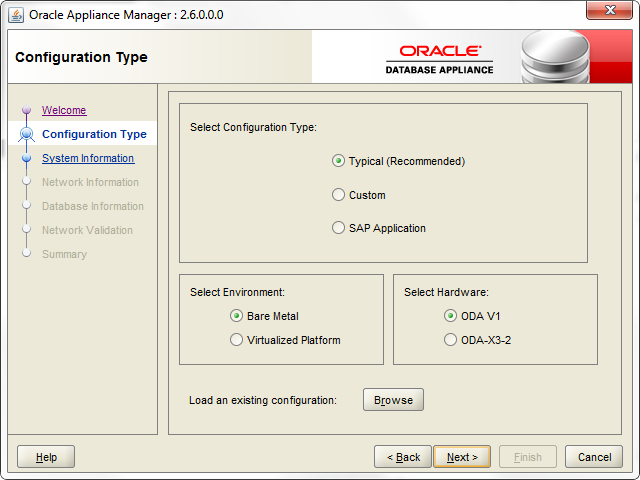 Oracle Database Appliance Software version 2.6 is now available for Download. ODA 2.6 is the first version that contains combined software for ODA V1 and ODA X3-2. This release also has an offline configuration Tool that will work with Virtualized and Non Virtualized ODA Configurations. This provides a lot of help in upfront planning and configuration of the Database Appliance. The offline configurator is available on Oracle Technology Network and can be downloaded here. The Configurator now asks a set of Questions like Environment and Hardware to determine deployment and network structure to use. The Information Center and various notes on MOS still have not been updated yet with ODA 2.6 information. As always please test before deploying to production.